Hide the entire store behind the login form using the Store Login Access extension. Customers will not be able to see the catalog, prices, place orders until logged in. With several stores within one Magento installation, each providing its own privileges and serving different types of customers, it is crucial to limit access of customers to stores. For example you have a retail and a wholesale store, and want to disallow retail customers’ access the wholesale store. Or you want your customers to see the website only when they are logged in. 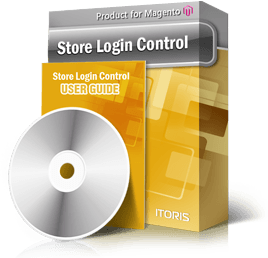 The Store Login Access extension for Magento will work great in this case. With this extension you will be able to easily manage your customers' access. These features can be used separately or combined, thus providing full management over your Magento stores. In admin area you will set the interconnections between stores, defining customers’ login and registration settings. From the front-end, independently on whether your customers switch between stores, login or create a new account during checkout, they will have only the gained access and privileges. Apart from bulk management of the customers, you can manage access individually inside customer’s profile in admin area as well. Store Login also allows setting where logged in customers should be redirected after login - to dashboards of the current or native store, to the main page of the current or native stores, or to a custom URL. Pending Registration - for example, you have a retail and a wholesale store. Your retail customers register in a regular way and have access to the retail store only. Your wholesale customers register, their accounts are pending. You validate wholesale accounts manually, and only after the validation the wholesalers are able to login and view wholesale store. Registration Fields Manager - You can create an expanded registration form for your wholesalers to collect all information you need, while your retailers will have a different registration (standard or custom as well). After the registration (pending for wholesalers if you wish) your wholesale customers have access to all stores, while retail customers van view retail store(s) only. The customers will have different account details as well. Smart Login/Registration - this module allows displaying login/registration forms in good-looking modal windows (DIV). Customers can login or even register while staying on the same page - there will be no redirects and they can continue from where they have been before login/registration.